Beautifully nourishing and hydrating for your skin. New natural technology involving gently deconstructing the Safflower plant seed, through a natural separation and purification process that respects the natural energy source harnessed inside the oilseed. These are Safflower Oleosomes – micron-sized spheres of moisturising plant oils and vitamin E, combined with our other carefully chosen natural Skin Silk ingredients*, including – Aloe Vera extract, Pomegranate Extract, Sesame Seed oil, Jojoba seed and Sweet almond oil. This in combination with our eco certified fragrance concentrate base, delivers subtle, yet long lasting aroma and ultra hydration. 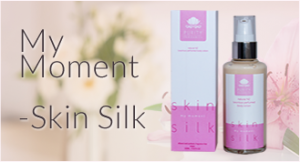 The result – a beautiful soft aromatic silk finish to the skin, with no oily residue. The perfect companion to wear with our fragrance range or to wear alone. Our Skin Silks are free from – denatured/perfumers alcohols, ethanols, synthetic fragrance, parabens, phthalates, polyethylene glycols(PEG’s), colours, and synthetic gelling agents. Perfectly Me – a citrus floral; notes of rose, ylang ylang and petitgrain. My Moment – a floral oriental; notes of bergamot, white champaca, and cedarwood. Happily Mine – a green earthy floral; notes of hyacinth, jasmine and sandalwood. 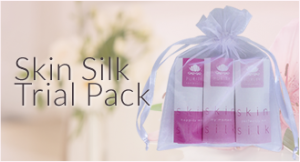 *For more detailed ingredient information please see our Skin Silks ingredients page.